If you ever thought of instant mashed potatoes as the culinary equivalent of disposable underwear, think again. With a few simple tweaks and some creative add-ins, instant mashed potatoes can, perhaps not quite surpass the homemade kind, but absolutely hold their own. Instant mashed potatoes are russet potatoes that have been cooked, mashed, and then dehydrated. This happens to be exactly how potato flour is made. But instead of milling the dried potatoes into a fine powder, they're crystallized into flakes, which helps keep them from clumping when you reconstitute them. Do not confuse potato flour with potato starch. Potato flour is dehydrated potatoes. Potato starch is only the dried starch which has been extracted from the potato. You cannot make mashed potatoes from potato starch, although you can, like cornstarch, use it to thicken a sauce. For one thing, they save time. There is no peeling, boiling, cutting or mashing involved. They're also shelf-stable. Dehydrating potatoes not only extends their shelf life, but it also reduces the amount of space they take up and makes them extremely portable. A pound of dried potato flakes is equivalent to five pounds of raw potatoes—about ten medium potatoes. If you don't have a car, or have a disability, or live in a small space with little room to store potatoes, or in a warm, humid climate where raw potatoes start to sprout almost as soon as you get them home, or for any number of other reasons, instant potatoes might be the best, most practical choice for you. The dehydration process does remove some of the dietary fiber from the potatoes. Mashed potatoes are seldom the top choice for people seeking to include more fiber in their diets. Still, the one thing instant mashed potatoes cannot provide is the rustic texture you get when you mash the potatoes by hand. 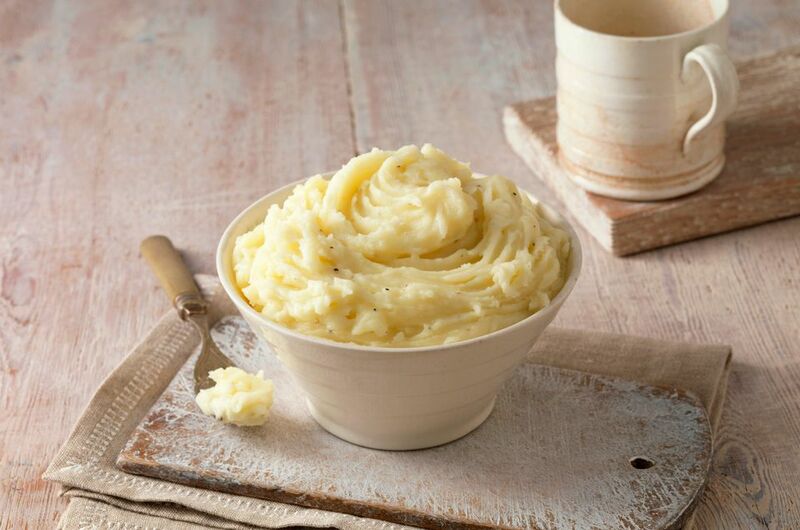 If you already prefer your mashed potatoes smooth, you have no problem. Others will miss the chunky texture, but keep reading for a solution to even that conundrum. If you're planning to stock your pantry with instant mashed potatoes, avoid any that contain ingredients other than dried potatoes. Butter flavoring, added salt or anything else are wholly unnecessary since you're going to be flavoring and seasoning your mashed potatoes yourself. When thinking about ways to jazz up your instant mashed potatoes, remember that jazzing up mashed potatoes is already a thing people try to do. Those same add-ins—chopped fresh herbs like chives or parsley, chopped cooked bacon, crumbled blue cheese, roasted garlic cloves and so on—will enhance the instant variety as well. Butter (not margarine) is a must, as is sour cream. Instant potatoes offer a couple of additional variables for you to play with. The instructions on the Bob's Red Mill bag call for you to bring water to a boil, then add butter and salt. You can substitute chicken stock—or any other stock, for that matter—for the water. The next step is to remove from heat and add cold milk. Again, here you have the opportunity to substitute cream, or evaporated milk, or buttermilk. It turns out that the very best substitute for those little lumps of potatoes in your handmade mashed potatoes is little lumps of potatoes! In keeping with our original goal of saving time and eliminating the need to traffic in raw potatoes, we are going to use canned new potatoes. Again, this is a shelf-stable product you can keep in your pantry alongside the potato flakes. When you're ready, open the can, drain and rinse the potatoes, and add them to a small saucepan along with 1/4 cup of milk. Bring to a boil, boil for one minute, then remove from the heat. Now, using your family-heirloom potato masher, mash the potatoes to the desired degree of lumpiness, and stir those handmade lumps into your prepared instant mashed potatoes.